Tascam iM2 shown fitted to an iPhone 4/4S. The iM2 does not come with an iPhone 4/4S which must be purchased separately. Each side of the iM2. The iM2 turns an iPhone 4/4S, iPad or iPod Touch into a high-quality stereo recorder. 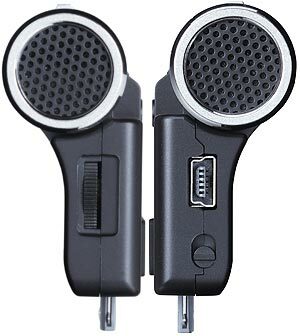 It consists of a pair of condenser microphones – the same ones as fitted to Tascam’s best-selling DR-series recorders – and plugs into the dock connector of your Apple device. The uni-directional microphone elements are adjustable over 180 degrees for the best sound placement. They are arranged in an AB pattern for detailed stereo imaging while capturing the ambience of your room. The iM2 contains its own microphone preamp and analogue-to-digital converter for low noise and high audio quality. Unlike mics that use the less-than-adequate built-in iPhone preamp, the iM2 can handle sound levels up to 125 dB to capture the loudest concerts and instruments without distortion. Also contained in the iM2 is a stereo limiter to tame sudden loud sounds. The input level can be adjusted with a dial on the side without even looking at the unit. It’s powered through the dock connector so no battery is required. 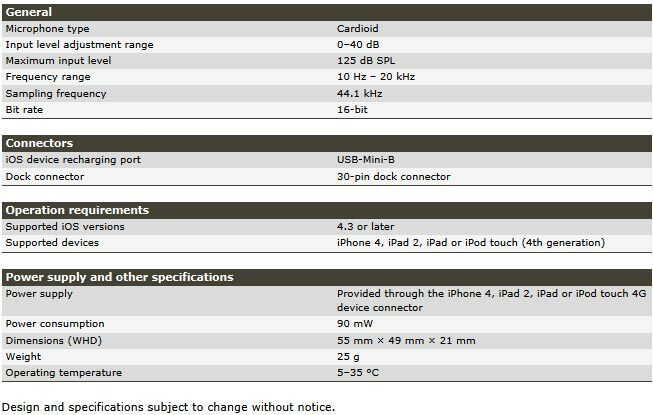 A USB input is provided to charge your iOS device for long recordings, either through a computer or an optional Tascam PS-P515U AC adapter. The iM2 works great with just about any recording app, including the built-in video camera. Record stereo sound while you capture hi-definition video on your iPhone to capture every moment with clarity and realism. An iM2 is not designed to replace a dedicated solid state sound recorder - it simply cannot compete with the features, facilities and sophistication of such a device. But if you have an iPhone and all you need is a quick way of improving your audio recordings on it, then the iM2 is for you. It's also an inexpensive way of having a backup recorder in case your normal recorder goes down or runs out of battery power and you're caught short during that important interview. Tascam have provided a FREE dedicated, easy to use iPhone App called PCMRecorder for the iM2, available from the iTunes Store, and this provides intuitive control of input level, microphone setting, equalisation, filters, and the limiter. Two versions are available - one for the iPhone and one for the iPad, both of which are available by clicking here.